Okay, so what’s the best pet to have if you’re a writer? Well, the answer is usually, a cat. Cats are quiet, and when they feel like it, they might even jump up and curl up on your nice warm computer monitor–well, not so much anymore since so many are flat screens, so in lieu of that, they might come and curl up on your warm…printer? Anyway, they keep you company without being an utter distraction; they’re satisfied enough with just an absent-minded scratch on the ears while you scratch out your next best-seller (keep your eye on the prize!). 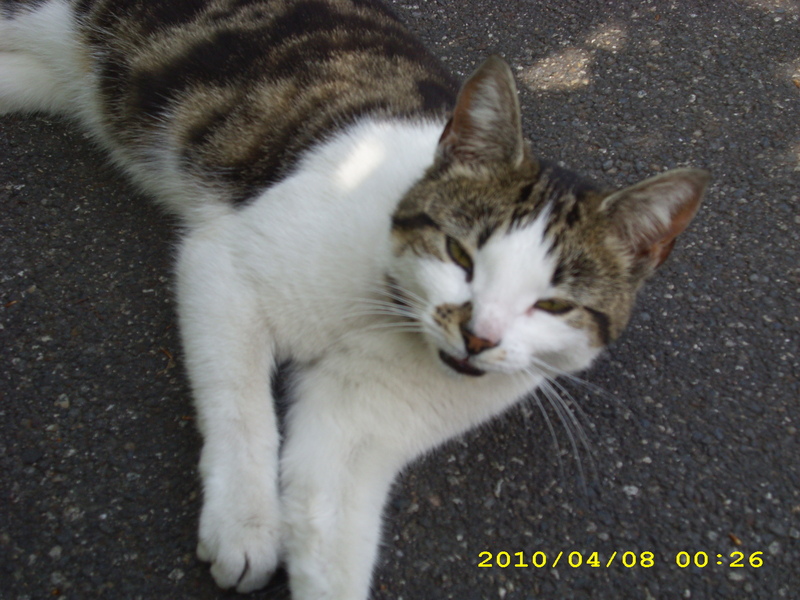 This was a cat that was hanging around the campus of the school I went abroad to in York, England. I know he looks like he was saying, "Feck off," but you have to figure, it was a sunny afternoon, and kibbies like that time to be warm and happy and above all sleeping. But kitty-cats aren’t for everybody. Some prefer dogs to cats, and that’s fine. If you have a dog that particularly begs for your attention, be the sort of person who regularly gives them their due attention anyway, so that they don’t have to beg for it when you’re writing (LOVE your pets people, it’s NOT that hard! if you can’t love your pet or pets, DON’T KEEP ANY!, and while you’re at it, unless you’re specifically in the business of breeding (and I’m not talking about the unfortunate existence of kitty and puppy mills, etc.) SPAY/NEUTER them PLEASE! Animals find ways to get it on when you’re not looking, even so-called indoor pets, or else, they’ll just be restless and unhappy because they can’t get it on, either way, you get stuck with one big problem, or a WHOLE lot of of little ones). But sadly, most COLLEGE DORMS have a problem with students keeping pets, beyond those lovely fish (heh heh), although that didn’t stop my roommate and I from illegally keeping a pet mouse, nor did it stop another girl in our year from keeping a kitten, although she got caught and my roommate and I didn’t because mice are significantly easier to keep a secret. I certainly wish I had a picture of the mouse we kept, but sadly he passed away a little over a year or so ago. Anyway, so what to do if you do want a cat but the whole dorm situations isn’t letting you do that? Because let me tell you, there is SOMETHING about a cat that just seems so perfect for the authorial atmosphere.Perhaps it’s because both are animals that are of kindred spirits, in the sense that they prefer independence but will occasionally interact with others if it pleases them (although not all authors are this way, nor are all pets this way, hence alternatives, like dogs). So what do you do? And say you live in an apartment off-campus, that shouldn’t be a problem, right? Except that in that situation, many apartment buildings don’t allow pets, and if they d0, there’s usually a limit to cats only, and what if you’re not a cat person, as we’ve already discussed? And what if you are, but you’ve got a problem when the landlord charges you extra money in addition to your rent (money you don’t have) to keep a cat? Not to mention you’ll be paying extra money (not including that extra charge to keep the animal on premises) in order to take care of the cat, (food, litter, toys, vet visits, etc.) because of course you’re a good owner who wouldn’t leave a pet to go hungry just because you’d be spending money you don’t have otherwise. My roommate and I actually did have a cat (we were foster caring for it, so no extra charge,) BUT he was a disaster (much as I love kibbies, “kibby” being a term my roommate uses for cats): I mean he was literally destructo-cat. Needless to say we were relieved when we finally found him a home. 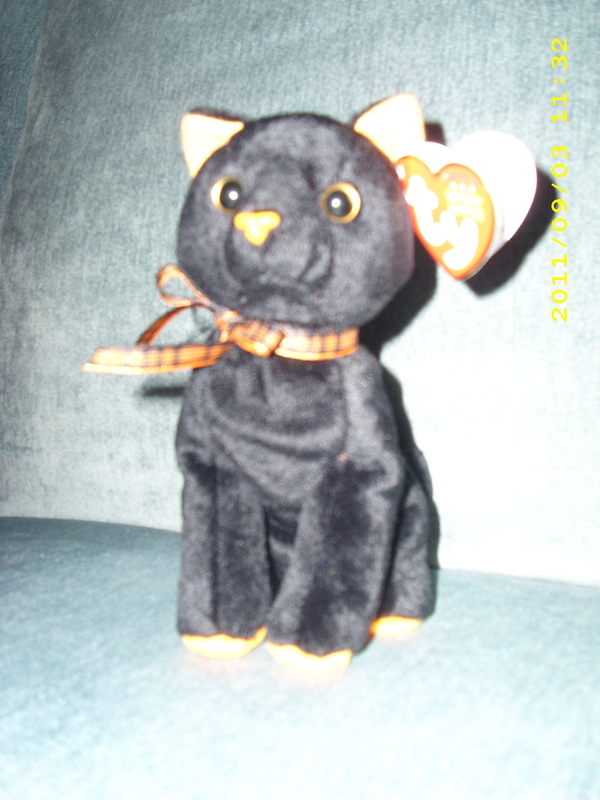 a Beanie Baby (TM) kitty (just in time for Halloween). There they are, perched on the bookshelf. "We LOVE yooouuu! Give us HUUUUGS!" 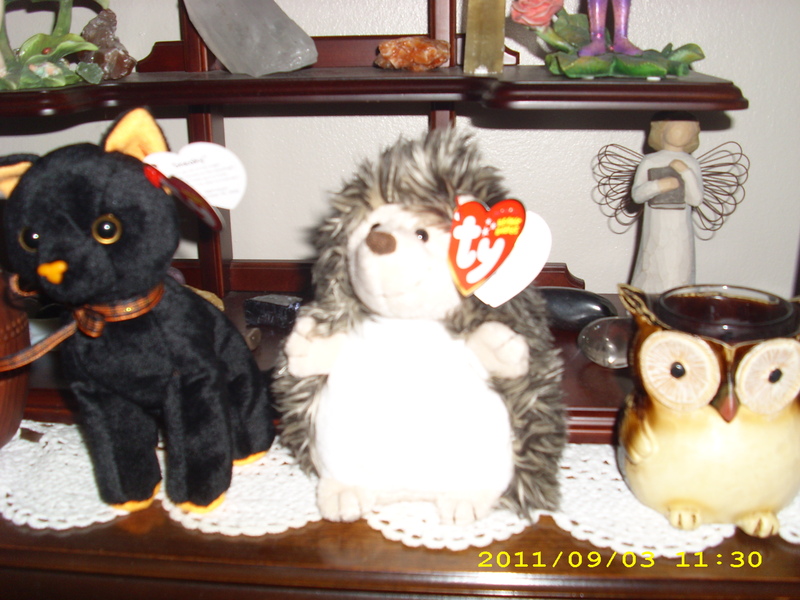 And yes, I’m aware that the owl isn’t stuffed, but you get the point, right? Right now my kibby's on the couch, but I'll perch him on printer on my desk. Innee CUUUUUTE? Although in this shot it looks like he gulped something surprising. "WHAT THE HELL DID I JUST EAT?!" So, yeah, you get the point, yes? Good. Stuffed kibby, or animal of your choice. Now you has writing companion. Problem solved. Next Post You Mean the Bank Wants to Take MY MONEY?? ?